The posting of links does not constitute an endorsement of the sites linked, and not necessarily even agreement with the specific posts linked. The Tragedy of William Cowper Brann, Waco's Infamous Firebrand -- "Brann received much criticism for his assaults on Baylor University—he was even attacked." The original Baylor scandal: An 1890s coverup of murder, lynching and gunfights -- "...the real victim in the sordid affair is Antonia Teixeira, a 14-year-old Brazilian girl who ended up pregnant while at Baylor." The Customary Practice of Headcoverings: An Exegetical & Historical Study by Greg Price -- "…that the uncovered head of men and the covered head of women in worship (as taught by Paul in 1 Corinthians 11) were cultural and customary practices that are NOT specifically regulated by Scripture (per the Regulative Principle of Worship)." Teens hailed as 'hometown heroes' for picking up elderly man who fell and taking him home to clean his wounds -- "A group of five teenage boys in Caldwell, Idaho, are being hailed as hometown heroes after a video of them picking up an elderly man and bringing him home to clean his wounds went viral on Facebook." Southern Poverty Law Center Is a Hate Group -- "SPLC...uses its past legacy of fighting against racism to add legitimacy to their evolving agenda of hatred towards the large number of Americans who hold conservative and religious values." Seminary removes stained glass windows celebrating conservative takeover of SBC -- "Stained-glass windows immortalizing individuals who helped move the Southern Baptist Convention to a more theologically and socially conservative position in the late 20th century have been quietly removed from the chapel of one of the convention’s six seminaries." How to Make Your Own Almond Milk -- "...you can easily make your own, homemade almond milk rather than buying it from the store..."
How a 29-Year-Old G. K. Chesterton Flipped 4 Arguments Against Christianity Upside-Down -- "…the reasons that I have for believing in Christianity are, in very many cases, to repeat those arguments which Mr. Blatchford, in some strange way, seems to regard as arguments against it." Dallas will no longer prosecute ‘petty crimes’ -- "There are few crimes that are “victimless,” and most victims are traumatized by the crimes committed against them." Congregationalism Doesn’t Stop at 8 p.m. -- "The congregation’s oversight of the church’s membership, discipline, and doctrine ought to be happening all the time." Blond vs. Blonde: What’s The Difference? -- "Further complicating matters is the fact that blond, in American English, is often the preferred default adjective while British English tends toward blonde. Can you say “confusing”?" A Case for Evening Worship: Sacred Rest and the Public Means of Grace -- "Holding two worship services on the Lord’s Day is one conspicuous way of fulfilling the purpose of the Christian Sabbath; it helps us keep the day holy by beginning and ending the day with the worship of God. It is difficult to set apart the whole day as a day of sacred rest and worship when there is only one service." Abortion clinic workers respond to 'Unplanned' movie — and they want out of the industry -- "The number of actual workers who have reached out is 94." 2 storm-related fatalities, multiple injuries after strong storms move across East Texas -- "Two children were killed in Angelina County and dozens injured in the Alto area after storms rolled through East Texas on Saturday." On the SBC Voices blog, Clayton Pruett, an SBC pastor in Illinois, wrote about The Shepherd and the C.E.O. Though I don’t agree with all points as he expressed them, I think the following excerpt below comparing the Shepherd and C.E.O highlights some problems with the “C.E.O mentality” that permeates American churches. It is good that someone in the SBC speaks against it. · C.E.O. Leaders see friendship and pastoral work as an obstacle to success. o Shepherd leaders see friendship and pastoral work as success. · C.E.O. leaders see accountability as a challenge to their authority. o Shepherd leaders see accountability as caring for their heart. · C.E.O. leaders know how to work the system and manipulate to get their way. o Shepherd leaders know how to work through things with others to get God’s way. · C.E.O. leaders build a talented team to carry out their vision. o Shepherd leaders build a talented team to cultivate the church and each other. · C.E.O. leaders see other churches as competition. o Shepherd leaders see other churches as family. You may read the entire article at the link above. Brian Kilmeade of Fox News raised a stink concerning Minnesota Representative Ilhan Omar, a Muslim, questioning whether she was “an American first.” That story I leave for another day (if at all), but it brings to me the question whether anyone who is committed to his or her religion can be “an American first.” I am a Christian. I am a Christian first. I am an American geographically and politically, and was an American first chronologically (born by nature before born by the Spirit). I am a Christian second chronologically, by a new birth that made me part of the family of God and the kingdom of heaven. In the end being “a Christian first” means recognizing when push comes to shove “we ought to obey God rather than men” (Acts 5:29). “A Christian first” does not mean I am un-American or anti-American. The Bible teaches the Christian to be a good citizen (Romans 13:1-2), pray for the leaders (1 Timothy 2:1-2), pay the taxes (Mark 12:17), and seek its peace (Jeremiah 29:7). “A Christian first” does not mean I place some other country’s interests before those of the United States. The Bible promotes an interest in the spiritual welfare of the people of all nations (Matthew 28:19; Psalm 33:12), but being “a Christian first” does not lead one to betray his or her own nation for another. “A Christian first” does mean that my citizenship is in heaven (2 Corinthians 5:20, Philippians 3:20) and I belong to a kingdom not of this world (1 Peter 2:9; John 18:36) – Jesus answered, My kingdom is not of this world: if my kingdom were of this world, then would my servants fight, that I should not be delivered to the Jews: but now is my kingdom not from hence. I am a Christian first. acronical, adjective. Of the rising or setting of a celestial object: occurring at or just after sunset. baby face, noun. A youthful, smooth, or innocent face; (also) the face of a baby. Frequently attributive, esp. as a nickname; cf. baby-faced adj. bluff charge, noun. An instance of a large animal moving aggressively toward a potential threat or prey, then abruptly stopping without attacking. bumfuzzle, verb. transitive (often in passive). To deceive, confuse, or astound (a person or group); to bamboozle, bewilder. burkini, noun. A woman’s two-piece swimsuit that covers the entire body, leaving only the hands, feet, and face exposed. ​dade, verb, transitive. To lead and support a person who totters or moves unsteadily, esp. a child learning to walk. dun, verb, transitive. To make insistent or repeated demands on (someone), typically for the repayment of a debt. entremets, noun. A light dish served between two courses of a formal meal; dishes served in addition to the main course of a meal. hammajang, adjective. In a disorderly or chaotic state; messed up. Chiefly in predicative use, esp. in all hammajang. monocarpic, adjective. Of a plant: bearing fruit only once during its life cycle. mush, musher; noun. An owner-driver of a cab; a cab driver who owns a small number of cabs. niffer, verb, transitive. To trade or exchange (a thing) for (also with) another thing. old sod, noun. Usually with the. One’s country of origin; spec. Ireland. patzer, noun. A poor player, a novice. picayune, adjective. Of little value or account; small; trifling (also, noun, formerly, in Louisiana, Florida, etc. a coin equal to half a Spanish real). quattrocento, noun and adjective. The 15th century in Italy, considered in terms of its art and architecture. routinier, noun and adjective. A medical practitioner who has been trained in various procedures but lacks broader knowledge or experience; one who applies treatments in a rigid, mechanical way. sprunking, noun. The action of beautifying or adorning oneself. Chiefly (and in earliest use) attributive, esp. in sprunking glass: a mirror. tarblish, adverb. To an acceptable degree; moderately, fairly, reasonably. Those who argue for contemporary worship recognize distinctions in music that undercut their own claim that musical meaning is esoteric. Even within contemporary music, there are genres and stylistic differences; everyone recognizes these differences and takes them into account when choosing songs and planning worship services. Indeed, much of the rejection of traditional worship music takes the form of critiquing what that music communicates: stiltedness, formalism, a distant God. It cannot work both ways: musical meaning cannot be waved off as a mere subjective interpretation on the one hand and then employed as an objection to traditional music on the other. Advocates of contemporary worship cannot claim that their music communicates the very same emotions as traditional hymnody while simultaneously disparaging what traditional hymnody communicates. The following hymn by Baptist minister John Fawcett appears in Hymns Adapted to the Circumstances of Public Worship and Private Devotion (Leeds: G. Wright and Son, 1782). Though it often appears online with many less, the printing in the hymnbook contains seven stanzas. On the death of the Rev. Mr James Hartley, late of Haworth. To take its awful flight. Was his support in death. O may we ready stand! To dwell at thy right hand. Last Saturday I commented on Praying in Pennsylvania – which was primarily about a Christian lawmaker’s prayer in the Pennsylvania State House. Atheists want to pray too! Who knew? Commenting on the “aggressive” prayer by Christian Stephanie Borowicz, Weaver said, “We live in strange times.” You got that right! What in the world is a “prayer” by an atheist? There is no such a thing! There is no God to pray to, no expectation of answered prayer, merely a hypocritical formality and a desire to be “included.” Prayer is the act of invoking or calling upon a deity, spirit, etc., for aid, protection, inspiration, or the like; supplication. Our society keeps redefining things into oblivion, so that an atheist may invoke a deity “for aid, protection, inspiration, or the like.” Ha! If the Pennsylvania Senate wants to give an atheist a forum to address its opening, so be it. However, let us be honest and not pretend it is prayer. Weaver delivered her first invocation at the Pennsylvania Senate in April 2015. Mike Argento atrociously announced, “since the world did not come to an end and the Senate wasn’t swarmed by locusts or pelted with a shower of frogs or hurled into a lake of fire, she was able to make a return trip.” By that standard, I’m sure we will see Argento in the forefront of encouraging Borowicz’s return trip to pray at the Pennsylvania House. The way they cried and hollered, you would think they were worried about the world coming to an end because of Borowicz’s prayer. Maybe it was just the case of the “hit dog” instead. [i] This DAFT group has a strange way of educating people to the dangers of belief in a supernatural being. Their watchwords are supposed to be reason and science, yet a little fake prayer evidently doesn’t hurt either. “Columbus Day” has not attracted much attention; it is far away and not as notable. However, the change of “Good Friday” to “Spring Holiday” has garnered attention and created something of a stir. Good Friday is a major day for many many folks in various Christian traditions. Personally, I see Good Friday as a Roman Catholic invention. I do not recall Good Friday ever mentioned in my growing up days in a rural East Texas Baptist Church. Neither do I think it biblically corresponds to the day Jesus was crucified. Finally, the Bible does not set aside the crucifixion or birth of Christ as “church holy days.” This is not found in scripture. On the other hand, I am not fighting Good Friday as a holiday that our society recognizes. My place of employment gives the day, and I will take it regardless of what they call it. Now the Roman Catholic “invention” has become a Mayor John Hamilton “unvention.” Hamilton wrote in a memo, “We are terrifically proud of our diverse workforce at the City. That diversity makes us stronger and more representative of the public we proudly serve. These updated names for two days of well-merited time off is another way we can demonstrate our commitment to inclusivity.” In reality, Hamilton’s words conceal a duplicitous aim to include by excluding, to not to offend (some) people by offending (some) people. I believe the actions of those like Mayor Hamilton are hypocritical and duplicitous, as well as a demonstration of a certain type of lunacy. Just kept your eyes peeled and your ears to the ground. I suspect we will find that Bloomington’s “Spring Holiday”" will always be on Friday before Easter rather than the third Friday of April! I sent the following note to the Mayor Hamilton, though it is likely he will never read it. I am a Christian, but I do not observe Good Friday. I am not a citizen of Bloomington, but rather an outside observer. I will be quite interested to follow this to find whether “Spring Holiday” will always be the third Friday in April, or whether the city will hypocritically move it around to be the Friday before Easter each year! Thanks for reading my thoughts. Have a good day. Bible-Powered Flight -- "On a cold day in December, I walked into the Northeast Texas Rural Heritage Center in Pittsburg [Texas], not knowing what to expect...what I didn’t expect was a full-sized aircraft hanging from the ceiling. It is a replica of the Ezekiel Airship, which local legend claims was the first aircraft in the world to carry a human into flight." Candace Owens blasts hearing on white nationalism in House testimony -- "‘The hearing today is not about white nationalism or hate crimes, it’s about fear-mongering, power and control,’ Owens said, casting doubt on whether hate crimes in the U.S. have risen in recent years." 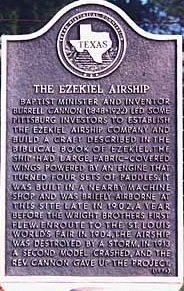 Ezekiel Airship -- "A sawmiller and inventor, Cannon got his idea for the airship from the Old Testament book of Ezekiel, which described a flying machine." Is Anyone Born Gay? -- "Sexual orientation seemed self-evidently true. But what truth did it reveal?" Love From Midland -- "Born in Texas, silent film actress Bessie Love became a star in Hollywood." Presidential Powerboat -- "After extensive restoration, LBJ’s prized 1965 craft is back on the water." Protest over conservative speaker prompts call for Baylor to recognize LGBTQ student group -- "Protests over a speech at Baylor University by a conservative blogger on record as opposing the “LGBT agenda” prompted more than 2,200 current and former students and other supporters to call on the historically Baptist school to formally recognize a gay-straight student alliance denied a charter since its founding in 2011." Romans: A House Church Manifesto? -- "...the author intends to demonstrate that the theology applied by the Apostle was consistent with some modern house church theologians --even that Paul was challenging the local churches of Rome to actually implement house church ecclesiology." Ted Cruz to investigate Yale Law School -- "This discriminatory policy indicates that Yale Law School would prefer to sabotage the prospects of their own students than see them advocate for mainstream Christian or conservative causes." Wide-Open Spaces -- "The roads out West call to the joys of driving."